GROW your veggies in a more affordable way. Our Grow Bag uses less soil than traditional planter boxes, and easier to harvest Root vegetables without digging up your Garden by using smart access flap in front. After your harvest you can replant new plants, or simply clean bag and store until next season. ✔️ SIZE: Perfect for your garden needs if space is an issue. Great for indoor and outdoor use. ✔️ EDUCATIONAL : Help teach smart young ones how to grow vegetables and be part of clean home grown food. ✔️ REUSABLE : When your crop is harvested, clean out bag and save for the next crop. 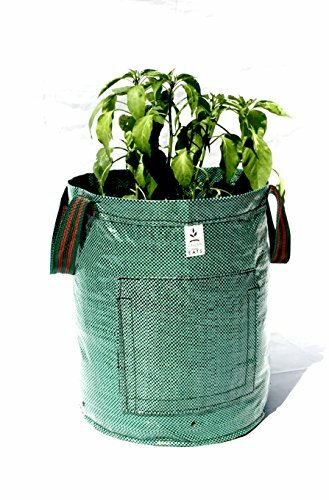 ✔️ DURABLE : Grow bag is manufactured with high quality polyethene, and has large sewn on handle to easily move your grow bag from place to place. ✔️ EASE : Harvest your crop with ease by opening the front flap on bag and only remove the veggies you want. If you have any questions about this product by Garden E.A.T.S., contact us by completing and submitting the form below. If you are looking for a specif part number, please include it with your message.